In Q3 & Q4 of 2016 a telecommunications company that dominates in the southwestern region of the US set out to increase plateaued sales for business solutions, specifically IT, cloud, and communications bundles. They partnered with ProgMechs to drive qualified leads to sign up on their website or over the phone. To target applicable key decision makers and business owners with a $150 CPA (cost per acquisition). ProgMechs segmented an audience by analyzing search history, time spent on identified websites, including the client’s homepage and sign-up page, and Amazon data. All of this inventory combined to build a strong remarketing pool to target desktop and mobile users with native units. ProgMech’s expert traders, combined with our proprietary machine learning algorithm, PONTIAC™ successfully optimized the best performing placements for each creative of the campaign to ultimately increase conversion rates. 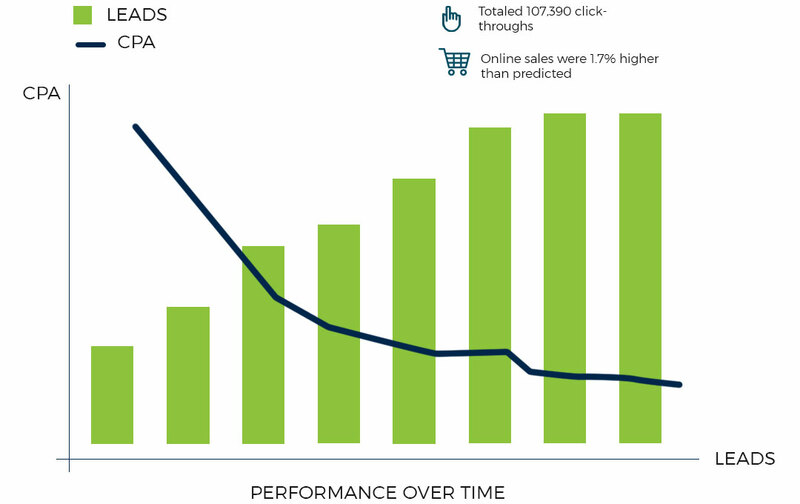 By optimizing aggregated data from high-intent buyers and PONTIAC™, this campaign was a true success for driving sales. In the end, ProgMechs exceeded our client’s set performance goal by 2.1x final CPA. Optimizing the strongest media placements in this way proved to yield the strongest ROI once again.